“Computer Composition With Lines” 1964 This work closely mimics the painting “Composition With Lines” by Piet Mondrian. When reproductions of both works were shown to 100 people, the majority preferred the computer version and believed it was done by Mondrian. 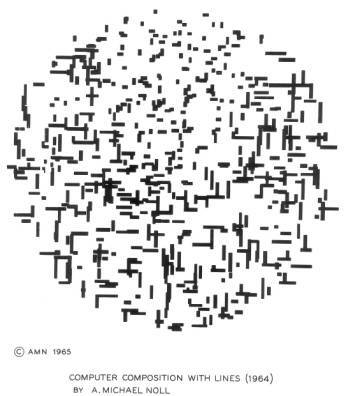 This early investigation of the aesthetics of computer art has become a classic and is described in the published paper by A. Michael Noll, “Human or Machine: A Subjective Comparison of Piet Mondrian's ‘Composition with Lines’ and a Computer–Generated Picture,” The Psychological Record, Vol. 16. No. 1, (January 1966), pp. 1-10.